If you’ve ever tried to ‘diet’ in the past without luck, this may be the most important note you ever read. No pills or gimmicks…just the simple truth. Enjoy! diet, and each contradict the other four books! What’s a health conscious person do to? There are third-world countries without any advanced medical care who are healthier than we “civilized folks”Does ANY of this sound acceptable to you? Well, now I have some terrific news. There’s a simple, 77-page book that’s already shot to the best-seller list because…well,it’s simple! It’s not a d.i.e.t — it’s a 5-step formula that makes ANY foodplan up to 5 times easier,faster and more enjoyable to follow. How would you love to “simply eat”? 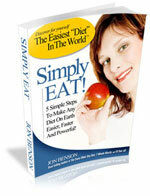 “Simply Eat!” is exactly what it sounds like –a simple, no-nonsense approach to sane and effective nutrition. That means you have more energy, less fat, greater health, and far less confusion. “Simply Eat!” works if you’re a vegan. It works if you’re on Atkins. It works if you’re on ANY type of food plan that’s based on unprocessed foods.